The Comet was made by cross-breeding a Crucian Carp and a mutated Ryukin, found in the pond of the Washington Fisheries Committee. It is named "Comet" because it swims quickly with a long, flowing tail, reminding us of an actual comet. After its creation, it was re-imported to Japan and is widely spread today. The Comet has the same body shape as the Wakin. Its body color is white and red, and a unique feature is its long, flowing tail. As its name suggests, it moves very quickly and is strong. Easy. Distribution amounts are high and you can find the Comet in various goldfish shops. Rearing difficulties Easy. While the Comet comes from the Ryukin, its vitality is strong because Crucian Carps were applied during the cross-breeding process. Except for the Jikin, all Wakin-family goldfish, such as the Wakin, the Shubunkin and the Comet, are very strong. Details of the above photo The Comet in the picture received first prize in the Comet parental section at the 2006 Goldfish Evaluation Convention in Shizuoka Prefecture. It has a well-balanced pattern and beautiful, long tail. Other There is a similar kind of goldfish called the Shonai goldfish (also known as the Yamagata goldfish). It is difficult to tell the differences between the Comet and the Shonai goldfish. 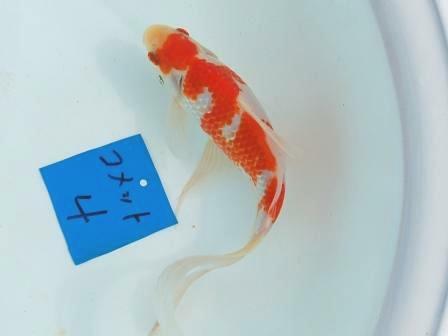 However, the Shonai goldfish is a rare local goldfish that was made by cross-breeding the Wakin and the Oranda sometime between 1912 and 1926 in the Shonai area in Tohoku. Its background is totally different from the Comet.